Ever since I read about Gordon Hempton’s One Square Inch of Silence project, I’ve been more keenly aware of our noisy world. 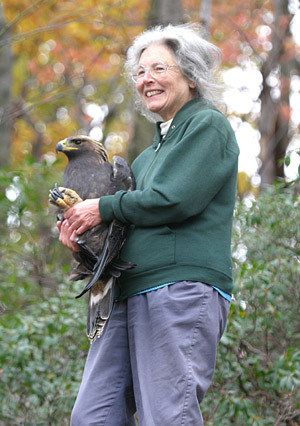 Hempton, a sound ecologist, has been recording natural sounds for decades. Nicknamed Sound Tracker for his recordings, he laments that every decade our world becomes noisier. While city dwellers are acutely conscious of humanity’s din, even those of us who live in the country find it difficult to escape the sound of jet planes overhead, the whine of a chainsaw, the roar of an all-terrain vehicle, or the rumble of trucks and cars on nearby highways. “Quiet is going extinct,” Hempton says. In 1998 he toured 15 states west of the Mississippi River and found only two places — remote parts of Colorado and Minnesota — that were free of human-induced noise for appreciable amounts of time. Even most of our national parks were and remain noisy. There are no places left on earth completely free of human-created sounds, Hempton laments, and he estimates that only one-tenth of one percent of the earth’s land surface is silent for more than fifteen minutes. Traveling our country in search of one square inch where it was quiet most of the time, he found what he was listening for in the Hoh Rain Forest in Washington State’s Olympic National Park where 95 percent of the land is a protected wilderness. There, on Earth Day, 2005, he dedicated the red square stone that marks his One Square Inch of Silence, according to Kathleen Dean Moore, who accompanied him to the place and wrote “Silence like Scouring Sand,” in the November/December 2008 issue of Orion magazine. “It’s an open glade, like the nave of a cathedral, carpeted in deep green moss and deer ferns,” she writes. Her description reminded me of the cross-country family camping trip we took back in 1981 and our visit to the Hoh Rain Forest on July 8. The Visitor Center was crowded, but by choosing the longer of two trails — the mere one-and-a-quarter-mile Spruce Trail — we were alone. As I wrote in my journal, “The rainforest was beautiful with enormous Sitka spruce trees, big leaf maples, and other tree species heavily draped with 70 species of epiphytes. Thick layers of moss clung to the tree trunks, which contributed to the awe we felt in that hushed forest.” Afterwards, we hiked a mile along the Hoh River in a fruitless search for harlequin ducks. Reporter Douglas Gantenbein also accompanied Hempton in to his One Square Inch of Silence. They hiked three miles from the Hoh Visitor Center and reached their destination 100 yards off the Hoh River Trail. We must have been very close to what has become almost a sacred place for the many people who also have hiked into the area and left their comments in a small metal canister called the Jar of Quiet Thoughts. Hempton thinks his one square inch can have an impact over 1,000 square miles, because not only does noise travel but so too does silence, and by defending his square inch he is also quieting a much larger area from thundering jets and other intruding noise. That is the theory, at least. Every month he sits next to the red stone and listens, and if he hears any mechanized noise, he records the date, documents the volume, and launches a complaint. Already, one airline has changed its route, but another has not. So even there, the roar of jet engines powering over the 7,000-foot high peaks in the Brothers Wilderness of the park is inescapable. “It’s physically impossible for a jet to fly high enough that its engines can’t be heard on Earth,” Hempton tells Moore. I know we hear them constantly as they crisscross our sky. Apparently, we are on a major east/west flight path because our son Steve, flying east at 30,000 feet, reported seeing our property below. But small, low-flying, propeller planes, while much less frequent than jets, are even noisier. We also hear traffic from Interstate 99 below our mountain, especially on clear, beautiful days and nights. Traffic is the largest noisemaker throughout the United States in cities as well as in the country. And here in Pennsylvania, the Keystone State, major highways and roads of all sizes are so numerous that we can never get far from one. Luckily, because we have no close neighbors, we don’t have to contend with the constant din of gas-powered lawn mowers, leaf blowers, farm machinery, and other noisemakers that admittedly have made our lives physically easier, but often create havoc in our bodies. According to numerous studies, excessive noise damages the ears of 10 million people in our country, raises our stress levels, and can contribute to high blood pressure and even depression. While some humans try to cope by using ear plugs and protectors, soundproofing their homes, and switching to electric-powered lawn mowers or even manual ones, for many people noise equals excitement. And they don’t mind sharing their music, loud machines, and even their shouting with the rest of us. I never realized how noisy our world was until I spent several days in 1985 in the high Andes Mountains of Peru. At 14,000 feet, the silence was amazing. In places where there were people, they went quietly about their work of herding animals, spinning wool, and washing clothes. No planes flew overhead; no cars or trucks roared past. We heard every birdsong and the high-pitched whistles of the vicunas. 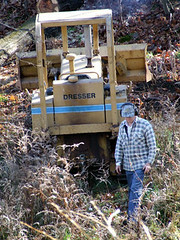 Bruce with his bulldozer. Sometimes, we are part of the problem, too. In contrast to that, a couple years later, I accompanied a public television crew to several Pennsylvania natural places I had written about. I remember the frustration of the sound cameraman because we had to wait many long minutes to film without the sound of traffic on nearby country roads or planes overhead. 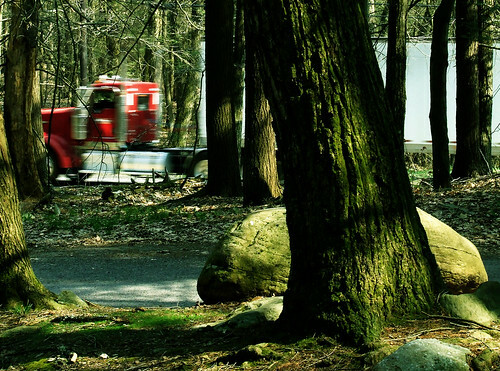 No matter where we go in Pennsylvania, it is difficult to escape from human-induced noise. Yet I’m convinced that is why many people take up such solitary quiet hobbies as fly fishing and archery hunting. Others of us escape our noisy world by walking in the woods, canoeing or kayaking in quiet waters, or sitting in tree stands listening and watching for deer. 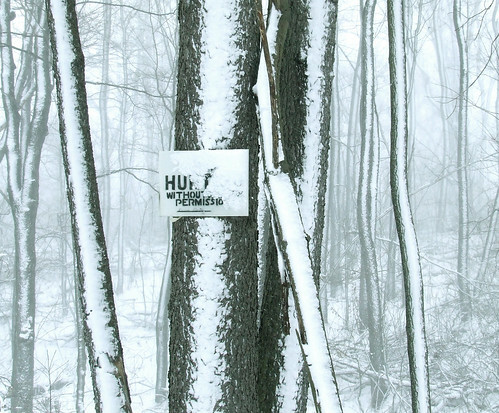 Hempton suggests that all of us who seek silence should practice hearing like a deer, something every good hunter already knows. “Deer listen in 360 degrees,” he says and to imitate them he advises us to go into the woods alone, wear quiet clothing such as cotton or wool, place ourselves near a tree or other object that will reflect sound towards us, create an irregular shape with our bodies, so we will blend into the landscape, stick foam earplugs into our ears before we begin to listen and then take them out in order to hear softer natural sounds, and move our heads slightly every so often, like deer rotate their ears. Moving even an inch may change how and what we hear, according to Hempton. And so, as often as possible, when I go out in our forest, I try to find my own square inch of silence, if only for a few minutes, and listen like a deer. On Sunday mornings, before the trains begin whistling our crossing at the base of our road, I can find perfect peace deep in our mature forest beside our stream. Listening carefully, I can hear the pitch of the stream changing as water flows over and around its rock-strewn bottom. Sitting on Turkey Bench above the stream one Indian summer day in early November it was so quiet that I could hear the crackling of leaves as they sifted down one by one in the still air. On another fine November day, I sat in the black cherry woods with my back against a tree trunk. A couple chipmunks discovered me and started their warning chipping call. Another chipmunk ventured close and ducked into a nearby tree crevasse before emerging and running in the opposite direction. Then, a ruffed grouse landed and quickly flew off again, but a few minutes later, a second grouse took off behind me. For a few minutes, I had become part of the natural landscape. Often, I need the sounds of nature — a hard rain or thundering wind — to mask humanity’s noise. I used to dislike the wind. Now I embrace it, especially on early November days when it sends eastern golden eagles heading south above Sapsucker Ridge. Fog often dampens sound, and I walk for miles through a specter-filled forest, billowing white around the black, uniquely shaped trees, and wait for the occasional deer to loom up on the trail in front of me. A snow-covered landscape also absorbs sound. Last November, on a cold day after a light snow, I encountered a buck 40 feet below me on the trail contemplatively chewing his cud. He looked straight at me, but even when I slowly raised my binoculars to ascertain that he had only one tall, curved antler on either side of his head, he never moved. We continued watching each other for several minutes before he roused himself, turned, and ran silently down the trail. Perhaps, he too was enjoying the serenity and sunshine of the peaceful morning. For more about noise pollution, The Allegheny Front, an environmental public radio program out of Pittsburgh, had a special on it during the week of 8/19/2009 — you can listen online. The page also has links to several groups interested in noise pollution including the Noise Pollution Clearinghouse and The Right to Quiet Society for Soundscape Awareness and Protection whose motto is “Hear Nature Again.” The latter has a Noiseletter, as they whimsically call it, filled with articles on a variety of noise-related subjects, which you can read online. Photos by Dave Bonta except where noted otherwise. Click on small photos to see larger versions. This entry was posted in Conservation, Travel Outside PA and tagged Gordon Hempton, One Square Inch of Silence. Bookmark the permalink. Thank you for this piece – it’s a really important issue, often sadly overlooked in the bustle and rush and noise. I’ll be passing this along. Thanks. Since I wrote that piece, there was an interesting article in the November 2 NEWSWEEK entitled “The Devil Loves Cell Phones” by Julia Baird, about silence. She also discusses a book called “A BOOK OF SILENCE” by Sara Maitland, which sounds intriguing. “Silence is Golden” as they say. 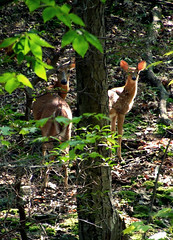 Noise pollution is so prevalent that I have heard people say when in wilderness areas that “the silence is killing me”. Even in northern Quebec wherre I frequently venture and there is no villages for hundreds of miles one has to contend with airplane noise, and sometimes the noise from logging. Thanks for the reminder that silence can spread just as noise does. Thanks. Finding silence is a never-ending quest. Thanks for writing. Excellent piece, Marcia. This autumn, I traveled across Canada and then through four western states. There were only a handful of times when I can claim to have enjoyed the sounds of the natural world without the accompaniment of human-created noise. The most memorable was an evening spent as, in all likelihood, the sole camper within Grasslands National Park in southern Saskatchewan. Thirty-plus years ago, when Don and I first bought our farm, we enjoyed extended silence on Sundays or evenings and nights. When I sold the place this summer, there was barely more than a minute or two without noise, and that would be during the hours between one and three in the morning. Most of the noise was created by traffic, but a lot of airplanes too. When I’ve been paddling north of where I lived, up in Ontario, it’s the airplanes that you notice. Thanks so much for your comment. If we weren’t so heavily invested in this place, I would consider leaving and trying to find a quieter location. But, as Bruce says, “Where?” Pete Dunne, in his new book PRAIRIE SPRING, finds solace in the High Plains in the U.S.A., but much as I like visiting them, I wouldn’t want to live in the grasslands. I really love these old Appalachians and hate what is happening to them in our state–long lines of industrial wind farms atop the highest mountains, drilling in the Marcellus shale for natural gas, which has already ruined the water supply in one Pennsylvania community, and all in a state that is still recovering from acid mine drainage and polluted waters from coal mining. How much more can the natural world stand? When will we pull out the final metaphorical rivet that is holding the natural world together? This is what keeps me awake wondering what kind of world we’ll be leaving our grandchildren. machine that can tuneout the frequency that is destroying the quiet? I wish I did. We had to buy a new refrigerator. The insides of our 42-year-old one were shot, although the motor kept going. Because of the room in our kitchen and the problem of getting most companies to deliver up our road, we had to settle on a certain brand that sounds like an airplane warming up. I’m slowly getting used to it. Just wanted to pass along the title of an interesting book I just finished reading, on this issue: Garret Keizer’s _The Unwanted Sound of Everything We Want_. Thanks for the suggestion. I’ll look into that book. Just south of Philly, we are nowhere free from the sound of traffic & planes. I’ve discovered that I compensate with selective hearing. Last spring at Ridley Creek State Park, for example, I made what seemed like a terrific recording of spring peepers only to discover later that they were in fact competing with the sound of a plane overhead. I never knew the plane was there. Instead of selective hearing, gettin old, as I am, means that your hearing diminishes. As long as I can still hear birdsong, though, I’ll be happy. And when the air currents are such that the noises from the valley do not reach us. I truly feel for you and your location.